Wow! Check out this amazingly adorable teething kit we received from Tylenol! We love that Tylenol has teamed up with Operation Smile to help children in developing countries! Parents can take pictures of their baby’s first tooth and create personalized e-cards on http://bit.ly/2aJq7rk. For each share of the e-card, Johnson & Johnson will donate $1 to Operation Smile, an international medical charity that has provides free surgeries for children in developing countries who are born with cleft lip, cleft palate or other facial deformities. It only took us a couple of minutes to create our photo and we love knowing that we are helping out children all around the world! You have until September 30th to create your card! Not sure if your child is teething? Here are some tips from Dr. Tanya Altmann, best-selling author and parenting expert. 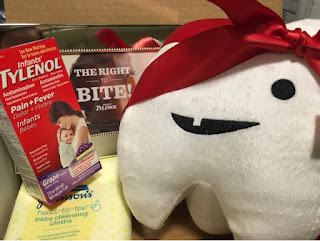 MamaBreak received a teething kit to review and share the Operation Smile campaign with our readers. We did not receive any other type of compensation. As always, our experiences and opinions are our own.